relationship between genre and style? 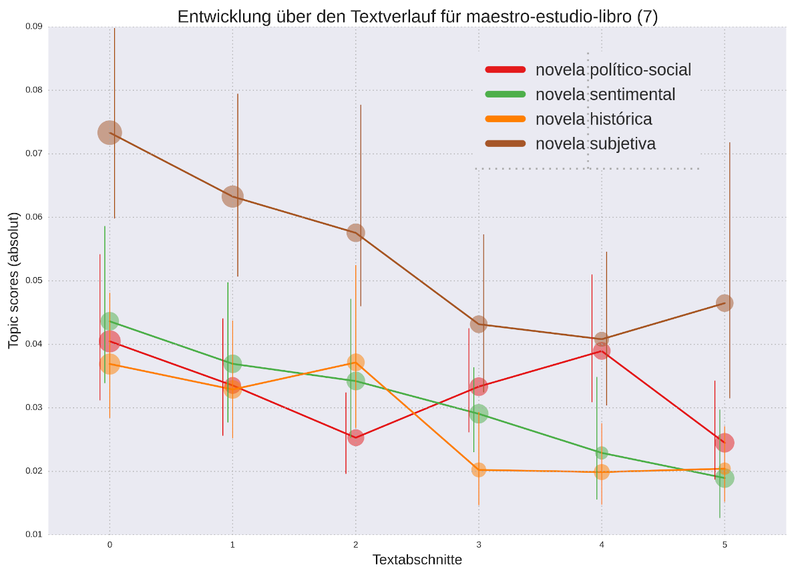 Junior Research Group "Computergestützte Literarische Gattungsstilistik"
How are topics and subgenres related? 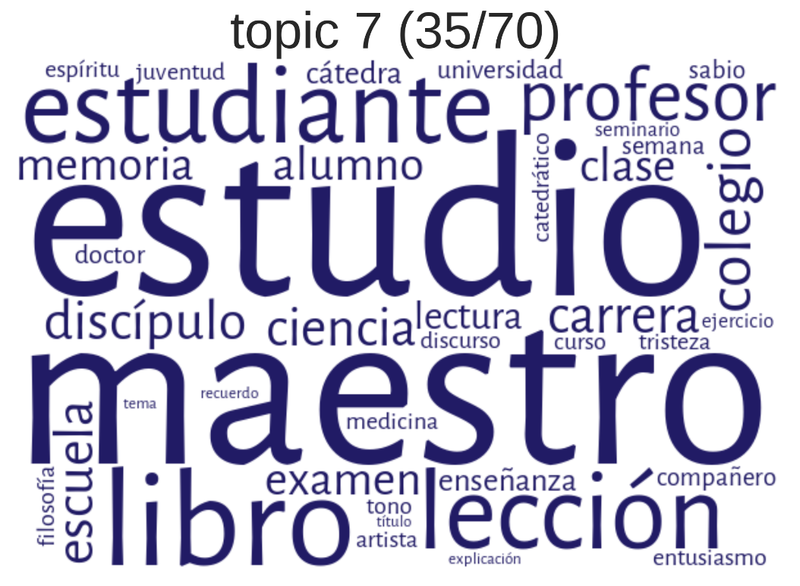 How are topics related to text development? How are topics in text development related to subgenres? Question: are there different patterns of topics over text development for different subgenres? but: rather exceptions than the general rule! emotion: trust, fear, joy, etc. Quiroga entretanto permanecía en Buenos Aires, bebiendo en la inspiración infame del tirano las más sangrientas ideas, y recibiendo las más terribles instrucciones. Quiroga, in the meantime, stayed in Buenos Aires, drinking the most blodthirsty ideas from the infamous inspiration of the tyrant, receiving the most terrible instructions. — ¡Oh! sí podrá usted, Fernando, sí podrá usted. A una mujer tan hermosa como ésta, lo difícil, lo imposible es no amarla. Es demasiado encantadora para que el corazón de usted pueda permanecer indiferente. Oh! yes, you can, Fernando, yes, you can. It's difficult, impossible not to love a woman as beautiful as this one. She is too charming for your heart to remain indifferent. SentiWordNet contains 117,653 entries, the NRC lexicon just 14,182. 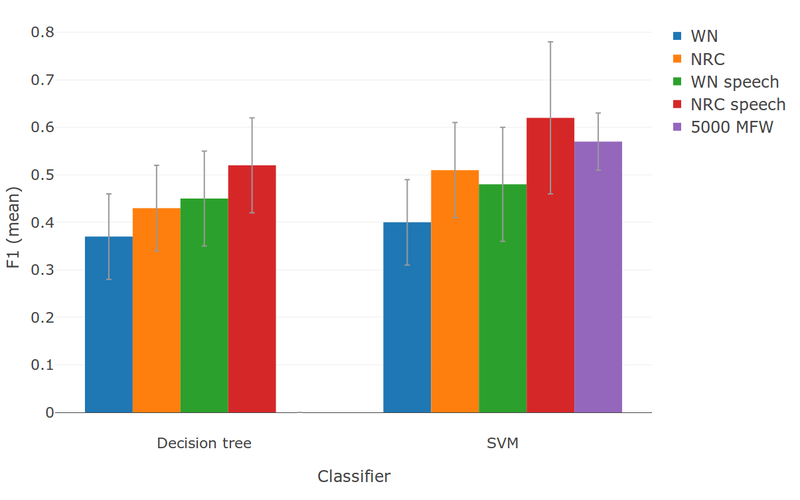 The advantage of Decision Trees is that they can be easily interpreted. Decision Tree: a tree-like model with a hierarchy of decisions. 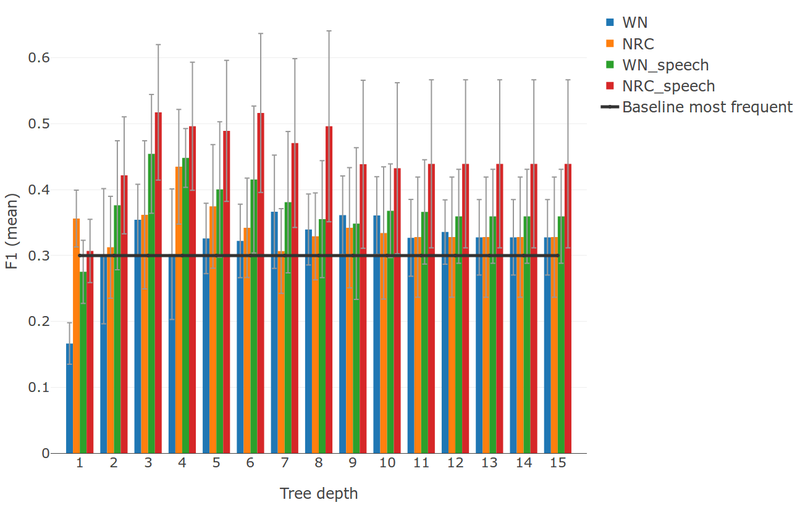 Each node in the tree represents a rule and each leaf represents an answer to the decision problem. 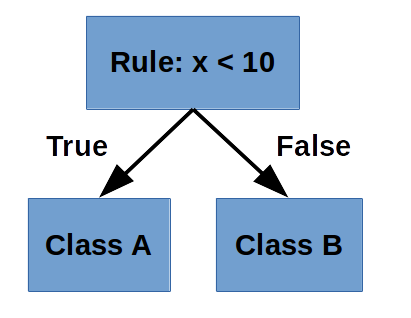 In a classification problem, the decision path to each class label can be followed in the tree, in this case, the path to the decision of the subgenre of the novel. La pluma no alcanza a describir las salvajes peripecias de aquella lucha espantosa. The quill not accomplish to describe the ferocious events of that fight frightening. scores for the test set! Baccianella, S., Esuli, A. and Sebastiani, F. (2010). 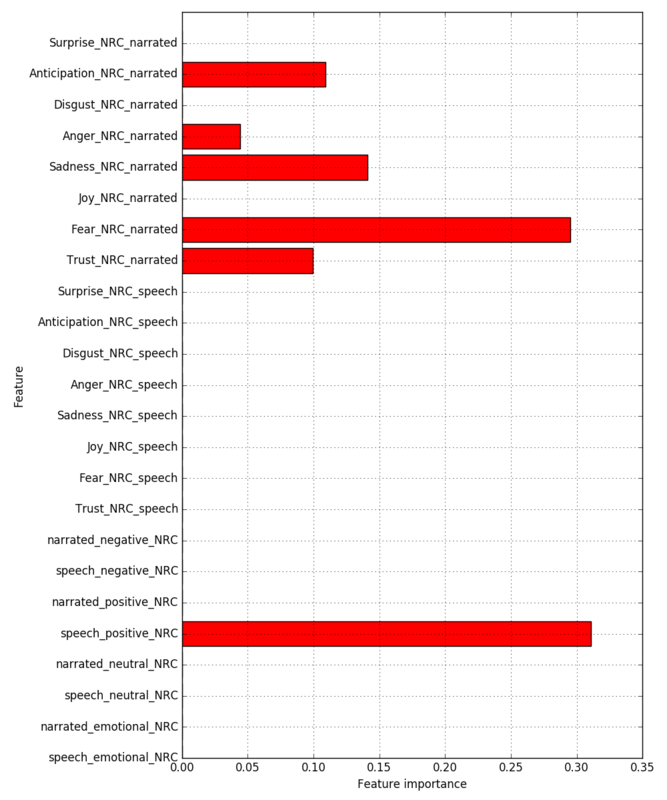 SentiWordNet 3.0: An Enhanced Lexical Resource for Sentiment Analysis and Opinion Mining. Proceedings of LREC 2010. Valletta, Malta: ELRA: 2200-2204. http://www.lrec-conf.org/proceedings/lrec2010/summaries/769.html. Blei, David M. (2011). 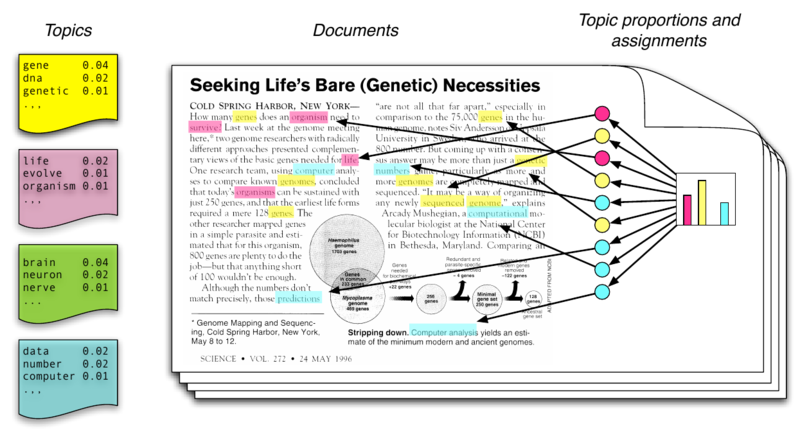 Introduction to Probabilistic Topic Models. Communications of the ACM. Henríquez Miranda, C. and Guzmán, J. (2017). 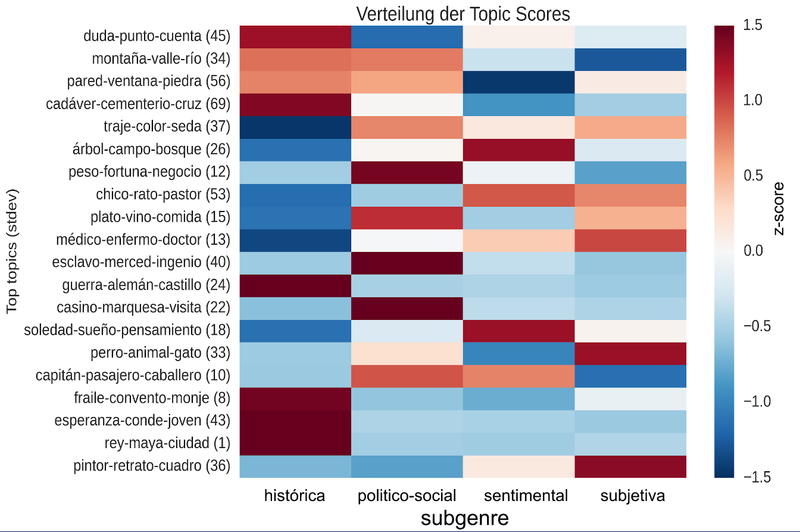 A Review of Sentiment Analysis in Spanish. Una Revisión Sobre el Análisis de Sentimientos en Español. 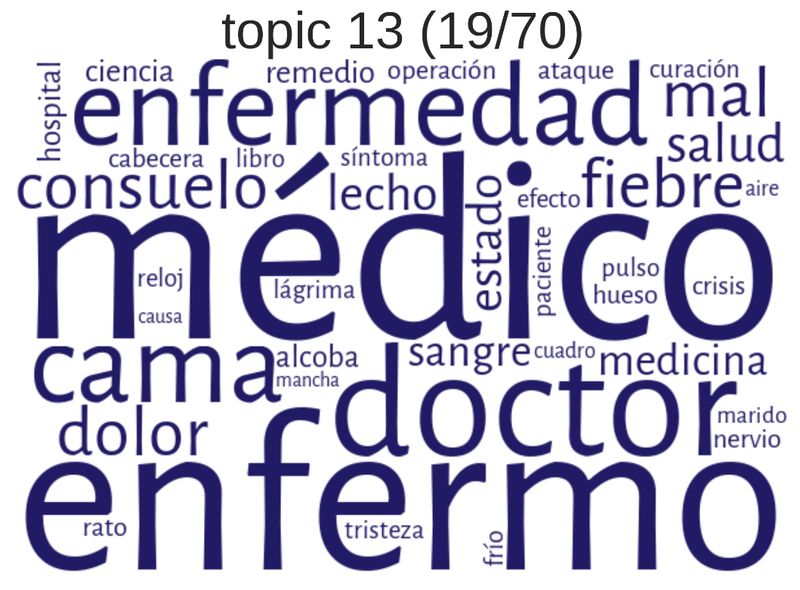 TECCIENCIA 12 (22): 35-48. doi: 10.18180/tecciencia.2017.22.5. Hettinger, L., Jannidis, F., Reger, I. and Hotho, A. (2016). 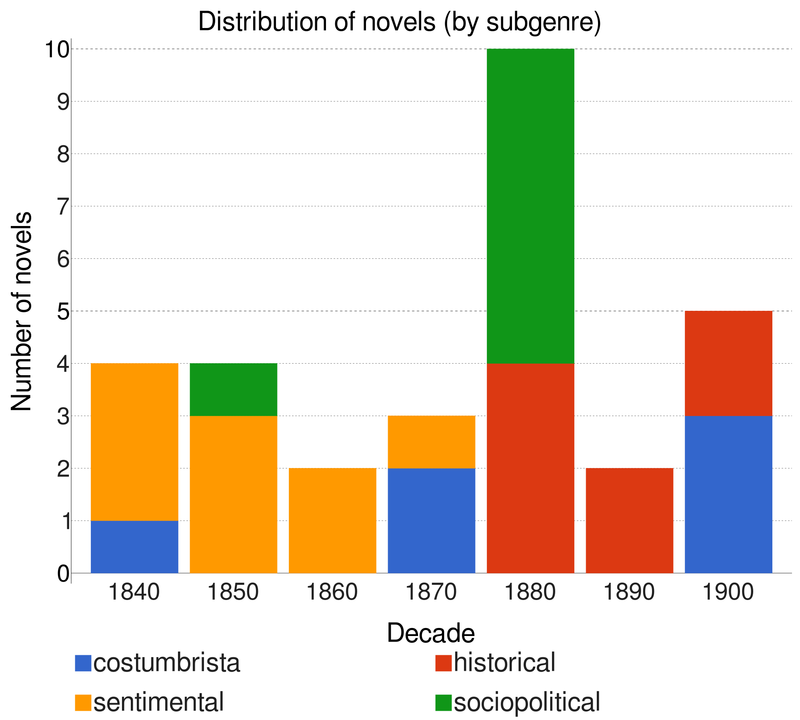 Classification of Literary Subgenres. DHd2016. Leipzig: Universität Leipzig: 154-158. http://dhd2016.de/boa.pdf. Jockers, M. (2015). Revealing Sentiment and Plot Arcs with the Syuzhet Package. Matthew. L. Jockers. http://www.matthewjockers.net/2015/02/02/syuzhet/. Juola, P. (2006): Authorship attribution. Foundations and Trends in Information Retrieval 1/3: 233–334. Kim, E., Padó, S. and Klinger, R. (2017). 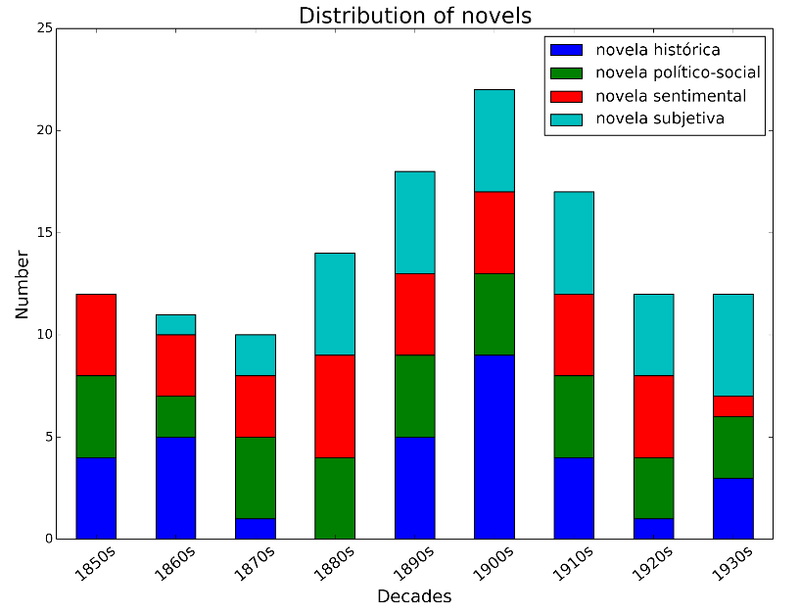 Prototypical Emotion Developments in Literary Genres. Digital Humanities 2017. Conference Abstracts. Montréal: McGill University. https://dh2017.adho.org/abstracts/203/203.pdf. Miller, G. A. (1995). 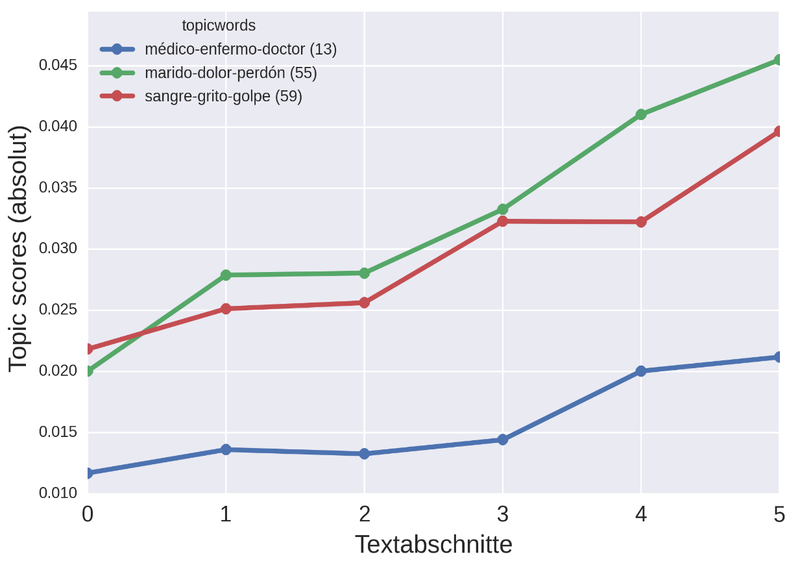 WordNet: A Lexical Database for English. Communications of the ACM 38 (11), 39-41. Molina, H. B. (2011). Como crecen los hongos. La novela argentina entre 1838 y 1872. Buenos Aires: Teseo. Padró, L. and Stanislovsky, E. (2012). 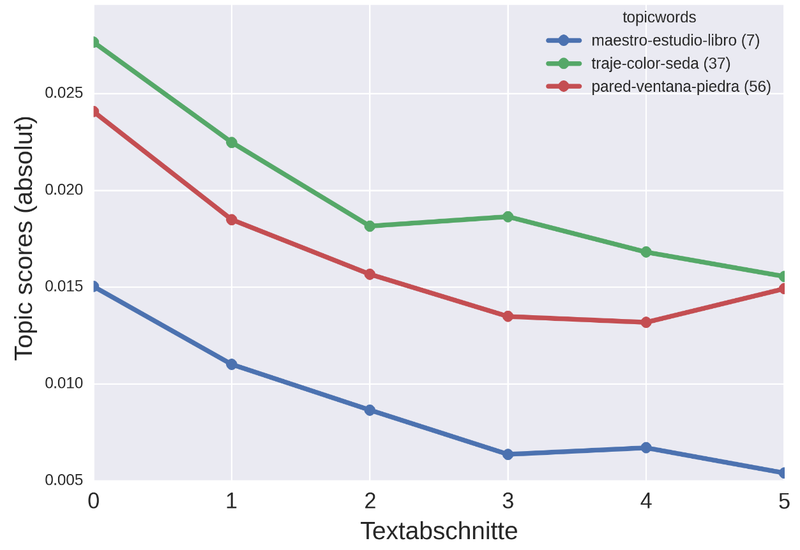 FreeLing 3.0: Towards Wider Multilinguality. 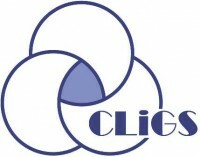 Proceedings of the Language Resources and Evaluation Conference (LREC 2012). Istanbul, Turkey: ELRA: 2473-2479. http://nlp.Isi.upc.edu/publications/papers/padro12.pdf. Pang, B. and Lee, L. (2008). Opinion Mining and Sentiment Analysis. Foundations and Trends in Information Retrieval 2 (1-2): 1-135. Saif, M. and Turney, P. (2013). Crowdsourcing a Word-Emotion Association Lexicon. Computational Intelligence 29 (3), 436-465. Schmidt, B. (2014). Typical TV Episodes: Visualizing Topics in Screen Time. Sapping Attention. http://sappingattention.blogspot.de/2014/12/typical-tv-episodes-visualizing-topics.html. Winko, S. (2003). 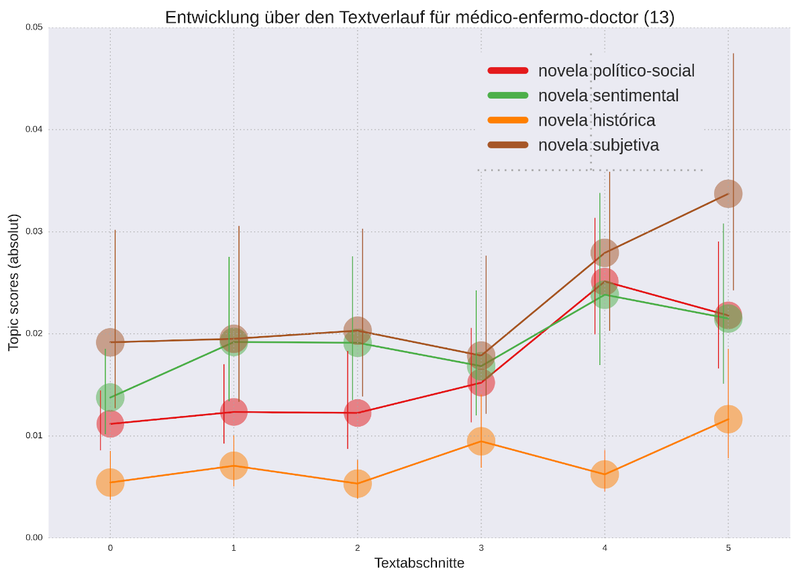 Über Regeln emotionaler Bedeutung in und von literarischen Texten. In Jannidis, F., Lauer, G., Martínez, M., Winko, S. (eds. ), Regeln der Bedeutung. Berlin: de Gruyter, pp. 329-348. Zó, R. E. (2015). Emociones escriturales. La novela sentimental latinoamericana. Saarbrücken: Editorial Académica Española.